What does it mean to love in Yiddish? Ever since I entered the so-called “Yiddish World,” I’ve found myself fascinated by the romantic lives of Yiddishists. Through informal conversations with friends about our Yiddish speaking relationships, I’ve noticed many positive themes, among them: feeling that a mutual passion for the language created a special intimacy, a common bond, or added a welcome “intellectual touch” to the relationship. But I’ve also traced some troubling patterns: Some Yiddishists feel insecure over their fluency levels, argue with partners over when and how often to speak it, and, in some extreme cases, feel that they are only in love with either the English or the Yiddish speaking side of the person lying beside them. I left these conversations curious and full of questions, which led me to create a survey that In geveb circulated last month. I wanted to explore the degree to which Yiddish plays a role in Yiddishists’ romantic lives, and why they challenge their romantic lives for the sake of speaking Yiddish. Before we get into the numbers, let’s figure out what we mean by Yiddishists. While Hasidim are the vast majority of today’s Yiddish speakers, there are several thousand non-Hasidic Yiddish speakers. These Yiddish speakers, both those who have Yiddish from home and those who studied it in a classroom, are often referred to as “Yiddishists” by themselves and by others.The non-Hasidic speakers are a diverse group, including all kinds of Jews both secular and religious, and also many non-Jewish Yiddishists; Yiddishists are Israeli, American, European, Australian, and beyond; they are old and young. Among the youth there are a small number of heritage speakers, while significantly more who have learned Yiddish at intensive summer programs or in university classrooms. They convene at events like Yidish Vokh, and are ever-present on social media. They tend to know one another, not only locally but also internationally, and often date and even marry one another. These people make up the “Yiddish world,” an alternate universe not tied to physical space—a small but tight-knit community in which everybody knows your (Yiddish) name. Yiddishists of the nineteenth and twentieth centuries declared Yiddish a national language of the Jewish people. They modernized the language and standardized its spelling, and promoted Yiddish as a modern language with a high culture, appearing within a similar nationalist context as modern Hebraists and Gaelic revivalists. 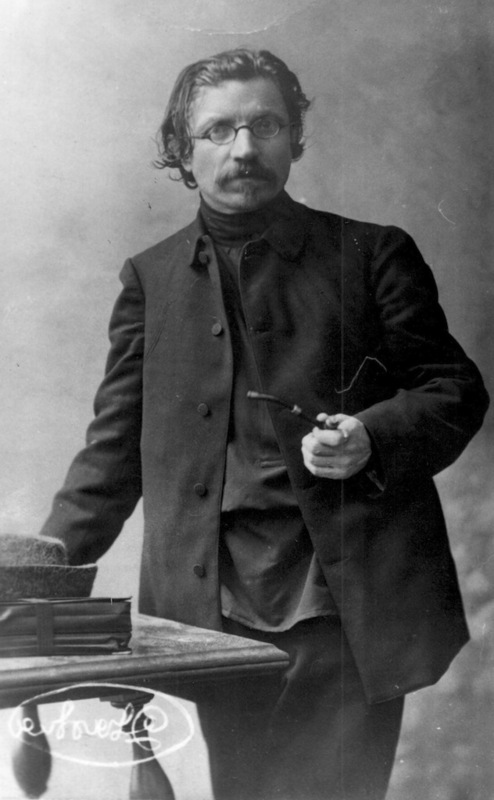 Some Yiddishists today connect to this nationalist tradition, but according to one definition, contemporary Yiddishists are simply people who choose to make Yiddish a part of their daily lives despite its impracticality; for them, speaking it is an ideological choice but not with the same goals as early twentieth century idealists. However, this definition of Yiddishism as a daily practice is not necessarily all-inclusive. A Yiddishist could also be someone who loves Yiddish and advocates on its behalf, but doesn’t speak a word. Some Yiddishists today mirror those of a century ago, focusing on promoting the language itself and its cultural legacy; while others try to create and inhabit immersive Yiddish spaces, such as Yiddish Hoyz and Yiddish Farm. Some Yiddishists are Hasidim or former Hasidim, and others were first secular Yiddishists who then became Hasidim, enticed partly by the opportunity to live in or near truly immersive “Yiddishlands” such as Kiryas Yoel or Boro Park. Still others view Yiddish as a way to engage with the Jewish past, present, and future in their daily lives outside of contemporary institutional Jewish culture. Because Yiddishism is often both personal and political, the language manifests in intimate contexts as well as in social and academic settings. A Yiddishist may be someone who speaks the language with their romantic partner at a cafe, while reading poetry, or during an emotional conversation. Perhaps the couple speaks Yiddish together on the subway, sharing the fun of people-watching and gossiping in a secret language. They may even speak it in bed. Yet some Yiddishists, despite their passion for the language, don’t feel “authentic” or like their “true selves” when speaking it. A Yiddish-speaking couple might code-switch, using their dominant language for heavy conversations, and Yiddish for the light stuff. A Yiddishist may date a non-Yiddish speaker and wonder if their partner can know the “real” person they are without knowing their “Yiddish side.” A Yiddishist might never speak Yiddish with their partner, except in bed. Seventy participants from nine countries answered In geveb’s call. 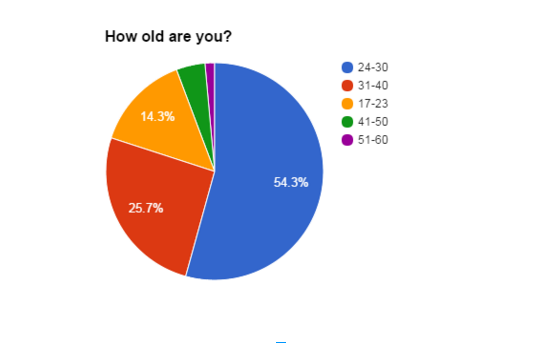 Only four participants were above the age of forty-one, a skewed sample surely influenced by the readership of In geveb and the fact that the survey was shared on Facebook, but indicative also of the blossoming popularity of Yiddish among young people (and that Yiddish summer programs are great settings for summer loving). In fact, the survey’s skew toward youth worked in its favor; since only 23 participants credit their Yiddish learning to their own families, this generational slant can tell us a lot about the ideologies of those who chose to learn it later in life. After all, Yiddishists of an older generation may have had more exposure to Yiddish in the home and from native speakers from Eastern Europe, while today’s youth learned it mainly in academic courses. 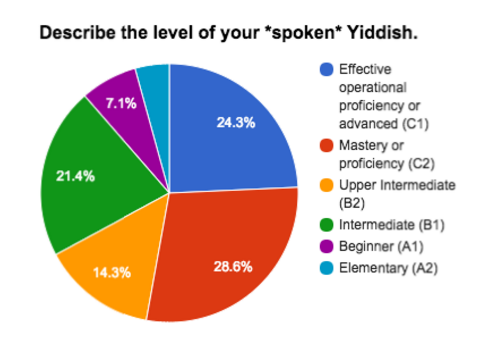 In this study, 80% of respondents learned Yiddish in a classroom, whether at a university or one of many Yiddish summer programs (such as YIVO, Yiddish Book Center, Yiddish Farm, Vilnius Yiddish Institute, the Naomi Prawer Kadar Program at Tel Aviv University, and others). 18.6% learned some or all of their Yiddish from a romantic partner. 58.6% of respondents identified as women, 35.7% as men, and 5.7% as trans, gender non-conforming, or genderqueer. Respondents reported having relationships that ran the gamut, from long-term romantic (45.7%), short-term romantic (51.4%), and marriage (27.1%); to primarily sexual, (18.6%). A significant 32% have been in one or more queer relationships, and more than half of respondents considered themselves very fluent in the language, a fact that reflects either the true fluency of the group, or, more pessimistically, indicates that respondents had a low standard for what high-level, fluent Yiddish sounds like. Perhaps most striking, however, were the discrepancies between women and men. 70% of women described themselves as being in or having been in the less fluent position in the relationship, while only 16% of men described themselves as such. Only five respondents identified themselves and their partner as having been on “equal” levels. 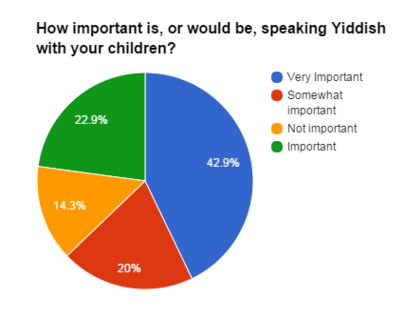 Finally, speaking Yiddish with current or future children ranked as important for a staggering 86% of respondents, hinting at one reason why dating another speaker might be an attractive option, and common experience. The juiciest data, however, was that of the qualitative variety. The respondents wrote with detail and candor about the role Yiddish played in their love lives. איך רעד מיט מײַן מאַן אין גאַנצן אױף ייִדיש די טעג. דאָס איז אַ באַשלוס װאָס מיר האָבן געמאַכט מיט עטלעכע יאָרן צוריק נאָך דער ייִדיש־װאָך, און איצט אַז מיר האָבן אַ קינד איז דער באַשלוס אַפֿילו שטאַרקער. I speak Yiddish with my husband all the time these days. This is a decision that we made several years ago after the Yidish Vokh, and now that we have a child, the decision is even stronger. Other respondents spoke Yiddish quite infrequently, citing that it “never really felt like ‘our language’ in any natural or authentic way.” Some couples made schedules, speaking Yiddish one or two days a week, and in one situation, a couple almost never spoke it until the break-up conversation, which they conducted entirely in Yiddish. In three examples, male respondents explained with varying levels of regret that while they speak Yiddish to their female partners, their partners almost always answer in English, or answer in English half the time. Regarding whether or not language ever caused a rift, approximately half reported that it played only a positive or neutral role in the relationship. Some respondents described speaking Yiddish as “fun,” “intellectually stimulating,” and a mode of “expressing Jewish identity.” The other half, especially those who spoke Yiddish with their partners most of the time, reported a variety of issues. Lastly, when asked if they had gone out with non-Yiddish-speakers since learning Yiddish, answers varied. Some hadn’t gone out with a non-Yiddish-speaker, others had and hadn’t asked their partners to learn, but most wrote that it was important for them that their partners show at least an interest. Most men had encouraged women to learn the language for them, while many female respondents implied that though a Yiddish-speaking partner would be ideal, they couldn’t be so choosy. If speaking Yiddish in everyday life is an act of ideology or of commitment to the cause of Yiddish continuity, then speaking it in the most intimate of moments perhaps takes this commitment to a new level. However, many committed Yiddishists do not end up partnering with members of this small social world, a fact that does not necessarily correlate with less commitment to “the cause.” Some respondents reported teaching or encouraging their non-Yiddishist partners to learn the language, but many said neutrally or regrettably that their efforts have fallen flat. Several wrote that it is hard enough just to find the right partner; who could possibly focus on whether or not a potential mate speaks Yiddish? And of course, this survey didn’t make space for the likely multitudes of Yiddishists who have never been in a Yiddish-speaking relationship, as a matter of circumstance. The most extreme or committed among the Yiddishists, the ones who wish to speak the language with their partners most of the time, do so with the knowledge that their commitment to speaking Yiddish makes their relationships more complicated. What does it mean that Yiddishists are willing to put their relationships through hurdles and turmoil for the sake of speaking Yiddish? This points to a particularly strong desire to continue the language, possibly because some feel they aren’t their “authentic selves” in English, or that they can access a desired individuality in Yiddish, and need their romantic partner to know their Yiddish side. The survey left me with a better overall sense of this intriguing phenomenon, but unsolved mysteries remain. Perhaps the reasons people seek love in Yiddish, despite its challenges, simply cannot be encapsulated by quotes and graphs. 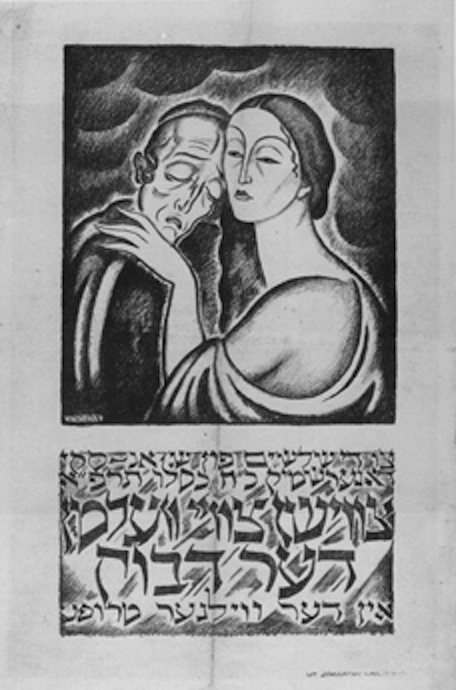 While the rarity of Yiddish romance is part of what makes it so intimate and enticing, due to the cultural and historical associations with Yiddish, these intimate relationships inevitably look outward toward larger ideological horizons as well. The Yiddish romance exists somewhere between the personal and the political, where the contemporary Yiddishist learns to love the language and its speakers. Fox, Sandra . “Smitten in Yiddish: Taytsh and Your Love Life.” In geveb, November 2015: https://ingeveb.org/blog/smitten-in-yiddish-taytsh-and-your-love-life. Fox, Sandra . “Smitten in Yiddish: Taytsh and Your Love Life.” In geveb (November 2015): Accessed Apr 20, 2019. 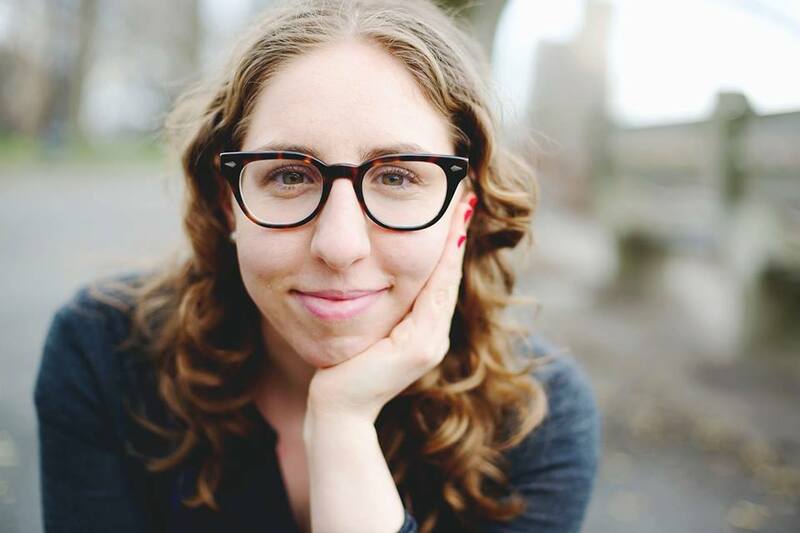 Sandra Fox is a PhD candidate in History and Hebrew Judaic Studies at New York University and the founder of Vaybertaytsh, a feminist podcast in Yiddish .